This piece was published approximately one month before Hurricane Irma struck the US Virgin Islands. To donate and help the victims of Hurricane Irma, you can donate to The St. John Community Foundation. Nobody leaves St. John wishing they hadn’t been. It is a vacation in every sense, and most people plan their return trip before flying home. 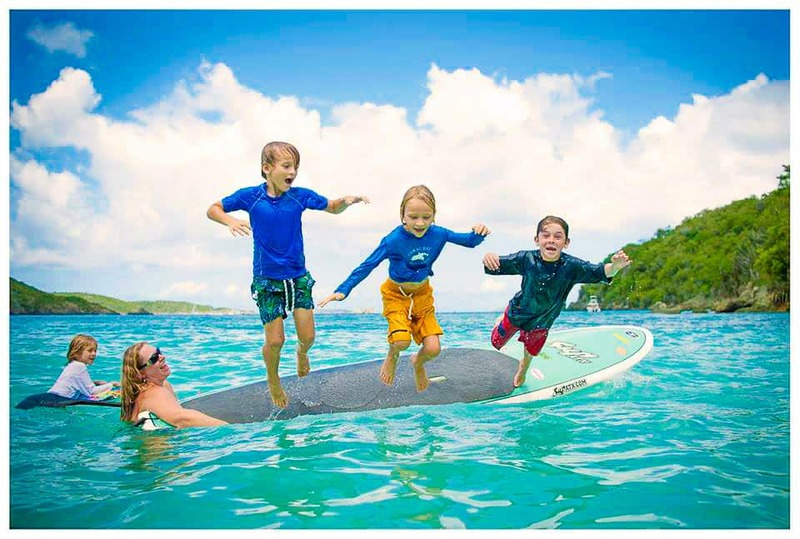 Of the three U.S. Virgin Islands, St. John makes a great case for being the most family friendly over St. Thomas or St. Croix. Hovering around 5,000 full-time residents, many of which work in the service industry, St. John is geared to its visitors. 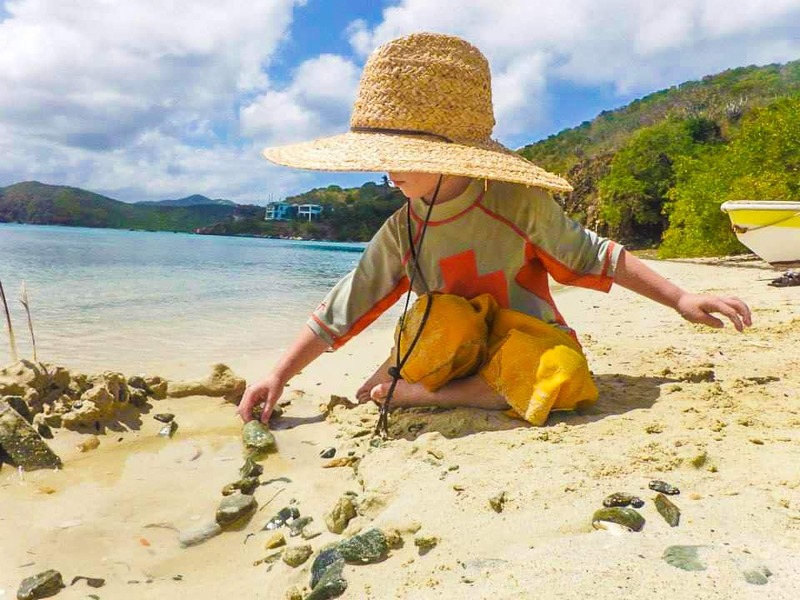 As any parent can attest, keeping kids occupied and off the screens can make a vacation memorable, and a St. John vacation is designed for such an experience. With nearly half of the island preserved by the Virgin Islands National Park, it is committed to being a destination focused on outdoor activity. 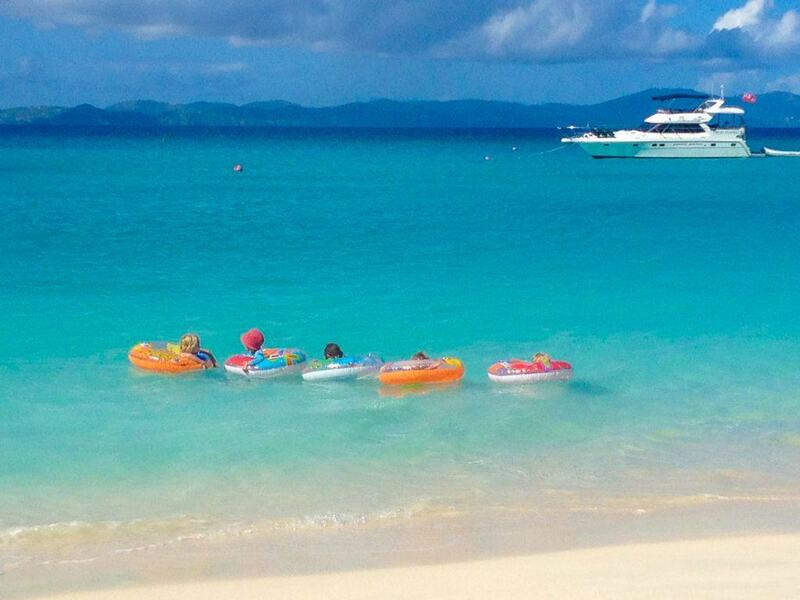 St. John is the most family friendly of the US Virgin Islands, and its ideal for large family vacations. 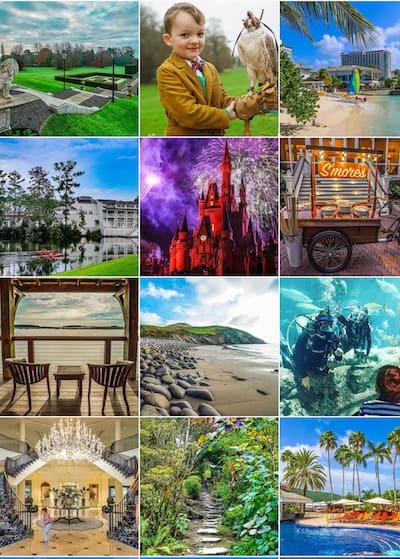 You can find plenty of luxuries as well, especially when it comes to dining, accommodations and activities but budgets can vary, and guests can find as much service at Joe’s Rum Hut as at The Waterfront Bistro. Only one requires shoes. Most people reach St. John by ferry from St. Thomas. So where is St. John? Is there a St. John airport? No. 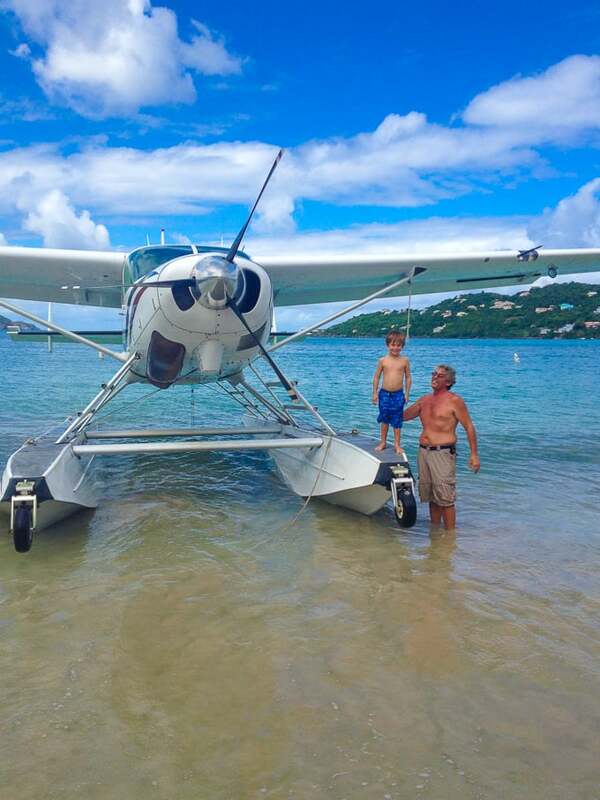 A four-hour direct flight from nearly any major East Coast Hub lands you on St. Thomas next door. St. Thomas is an island noticeably denser and more commercial than St. John, but also a great place to get acclimated, allowing travelers the opportunity to downshift one gear at a time. Greeted by a rum tasting station, a newly refurbished airport with air conditioning and friendly porters to help get your luggage to a taxi, travelers get their first glimpse of Virgin Island paradise. Let the dispatchers know you’re headed to St. John, and they’ll do their best to group you with others on the same path. Grab a roadie from the well stocked bar in baggage claim, because you are on vacation, then sit back on the 30-45 min trek to the ferry dock. You can ignore the cruise ships; they do not dock on St. John. St John is the ultimate multigenerational destination for a relaxing beach vacation with so many homes to rent that fit everyone. Photo credit Savannah Loftus. Ferries reliably run every hour on the hour from 6am until midnight from Red Hook port on St. Thomas and take less than 25 mins to reach St. John. Red Hook is further than the Charlotte Amalie port from the airport but a shorter ferry ride. Charlotte Amalie is closer to the St. Thomas airport, but only offers one scheduled ferry per day to St. John. As you disembark the ferry to St. John, porters will greet you with another round of flavored rum! It’s your vacation. Caneel Bay Resort (closed from hurricane damage) opened in the 1950’s by Laurence Rockefeller, and it has retained a clubby, exclusive atmosphere ever since. 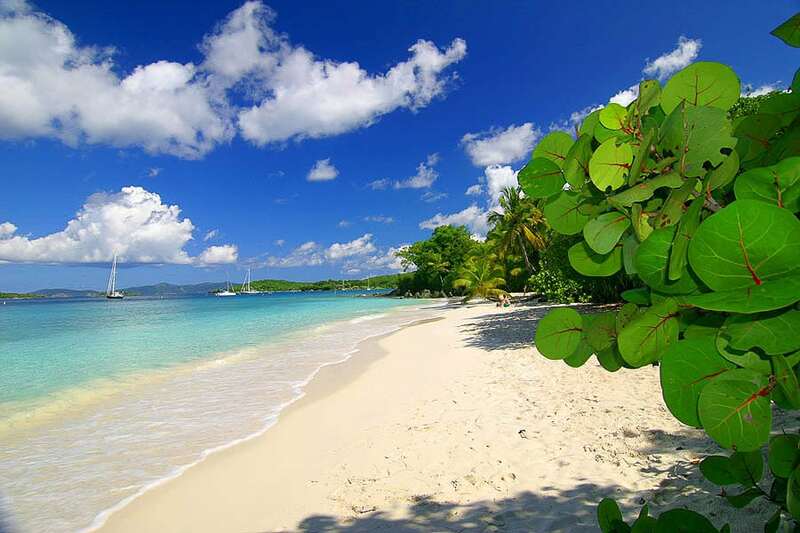 There is a loyal group who favor Caneel Bay Resort because their families have been visiting for generations. They overlook the dated rooms and tired feel that might not please all luxury travelers in exchange for a private area of the island. The Westin St John offers villas up to three bedrooms. Photo courtesy of the hotel. The Westin St. John (check your dates for rates) is the true St. John resort on the island that offers more modern villas, from studios to three bedrooms. There are ample activities for kids on site including a kids’ club for ages 3 to 12 as well as a weekly summer camp for the 3 to 9 year olds. Renting a home is what most families choose to do, particularly when traveling with the grandparents. There are hundreds of rental options and price point is a good indicator of what you will get, St. John is an accurate reflection of supply and demand when it comes to your accommodations. Despite the many options to chose for your accommodations, arranging in advance is a good idea, because is not a backpacker’s paradise. Rentals of St. John villas are a great place to start where owner managed homes like ours can be found on HomeAway as well as many more. These sites offer a wide variety of options from small cottages to luxury villas with pools and concierge and everything in between at a very low fee to the renter. Villa Management companies like Catered To and Windspree Villas offer even more focused assistance in securing your property and go above and beyond in matching your needs. Rent the perfect vacation home in St. John. And check out my family’s 5-bedroom home Kamabesu Villa that can accommodate a party of 16. The pool at Kamabesu Villa. Photo courtesy of Yelena Rogers. Ocean views from Kamabesu Villa. Photo courtesy of Yelena Rogers. Kamabesu Villa can sleep up to 16 family members. Photo courtesy of Yelena Rogers. June through August is a great time for great rates on flights and better off-season deals on accommodations. Thanksgiving is a hidden gem of a time to travel because high season rates aren’t yet in effect on accommodations, and many places will offer a discount for 7-10 day private home rentals. If travel is flexible, the first two weeks in December are notoriously low traffic in the Caribbean and off-season rates still apply to flights and accommodations. Winter and Spring Breaks are an ideal time to visit St. John, but book as far in advance as possible. Most places reserve a year out during high-season. While prices are at a premium, the experience is too. No, there aren’t nightly fireworks, not the traditional kind, but there are nightly sunsets that will stop even the most hyper child for just a moment, to take in the majesty and go…ahhh. St. John island is low on mainstream media but high on raw adventure. None of the local activities are commercially manufactured or sold by gimmicks or shifty sales pitches. If someone is peddling an activity, chances are, it’s worth investigating. This Virgin Island draws adventurers and sailors aiming to live a fantasy and share it with others. There are plenty of options for your young pirates seeking treasure and adventure in creative outlets. Sore muscles are a risk for both you and the kids, but it is always worth it. Your kids may have found the most magical place on earth. 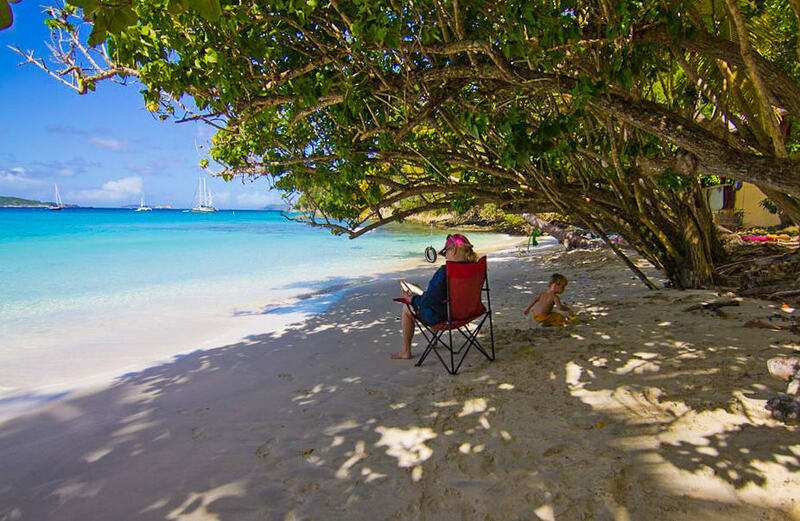 VI Eco tours, at Honeymoon Bay offer day beach chair/activity rentals. Grandparents can lounge under a shady tree, parents kayak with kids in tow and children can enjoy a sandy beachfront with floaties and life vests. 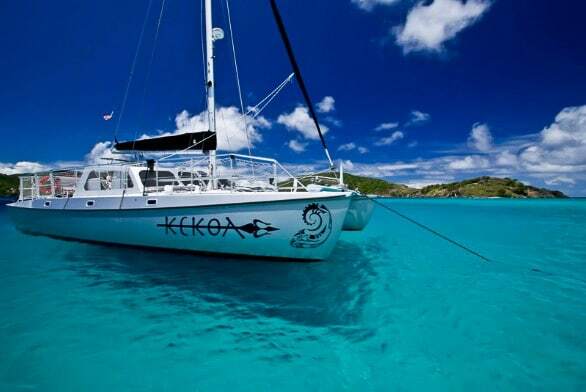 We highly recommend Kekoa Catamaran tours. Half-day snorkel trip on Kekoa Black Sail Catamaran is a great value for the family that plays together but also needs a soft place to land. With snacks between snorkel expeditions and a crew committed to guest experience, this is a trip that never seems to fail when it comes to quality family time! Maho Bay is great for a beach day with little ones as the bay is easy to access by car (if you go early! ), and the tides are gentle for those new to the ocean. A day visiting the BVIs can be pricey and time consuming, but it is also something you can’t easily replicate— especially if you visit The Baths, Indians or Caves. It’s like seeing the 8th wonder of the world. Contact Love City Excursions for great day trip plans or just take a jaunt around the island and save on the customs fees. Ram’s Head Hike, located near Drunk Bay on the far side of the island, is a good morning hike near the Salt Ponds. Depending on the season you can harvest some sea salt too! There are moonlight hikes offered through the Virgin Islands National Park at certain times of the years so check with them before arriving. Trunk Bay underwater snorkel trail is a tourist must, though it can get crowded. Check the cruise ship schedule from ships docked at St. Thomas and plan on going early to take advantage of parking. When swimming with youngsters it is best done with floatation devices as waves can get stronger the farther out you go. Beware of the gulls, they dive for food! The VI National Park Headquarters in town is a good place to checkin at the beginning of your vacation and see what is happening on island. There are many celebrations, festivals and activities. Some require advanced reservations like the Reef Bay Hike, while others allow you to pop in at will. Stand Up Paddle Board or Kayak tours with Arawak Expeditions is a great way to experience the island and wear out energetic young adults. Reef Bay Hike through the National Park is great for kids and adults who can walk for a few miles on their own and don’t mind a good sweat. 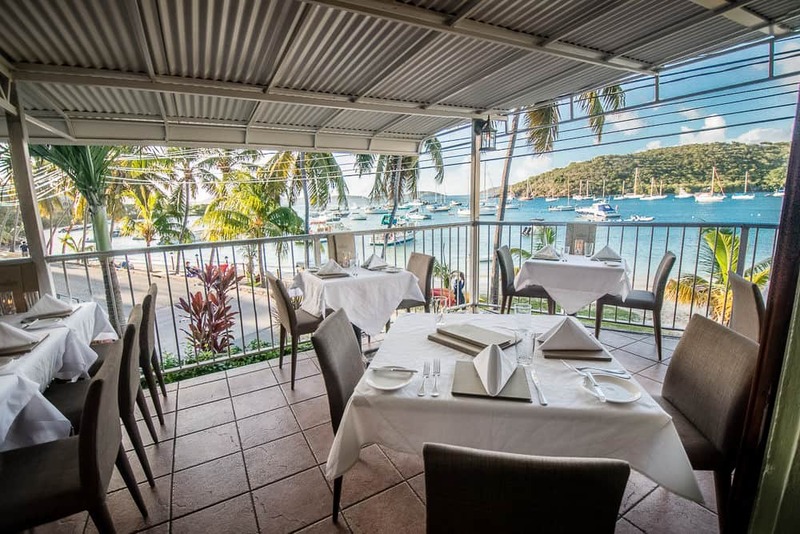 Cruz Bay Landing offers the best breakfast and kid-friendly atmosphere for all meals. It gets loud as the night goes on. Ocean Grill is great spot for a burger but known for desserts. A good local catch is always on the menu, too, and you’ll find easy parking at Mongoose Junction. 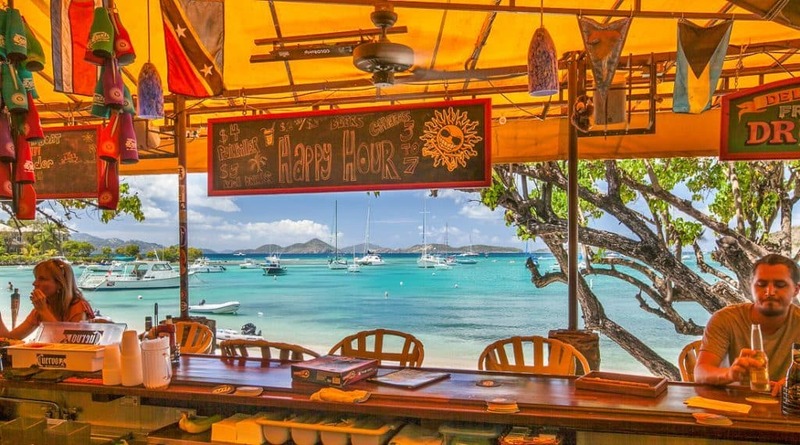 Joe’s Rum Hut, is known for the early happy hour. Go with kids and sandy feet! Order fresh-cut fries for the win. Longboard, go early for great deals and easier parking. 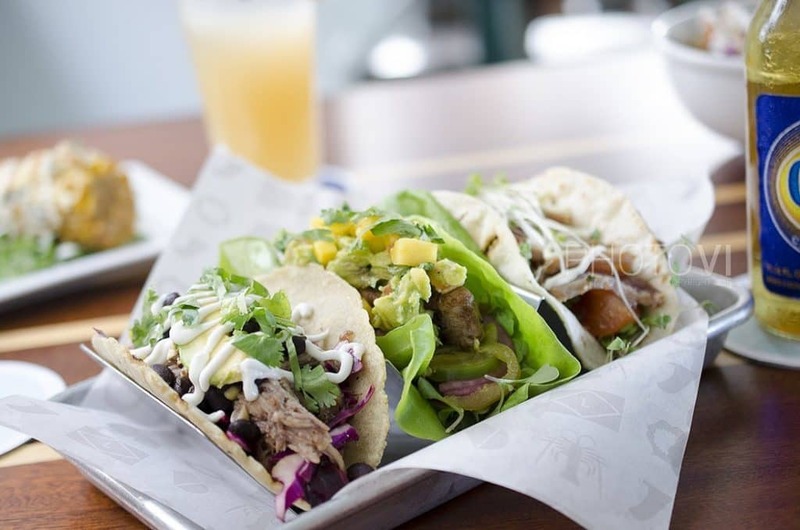 Stay for the tacos. The Longboard, St. John. Photo courtesy of the restaurant. The Longboard tacos. Photo courtesy of the restaurant. ZoZo’s at the Sugar Mill, requires advanced reservations and well worth the cost, so expect to spend a few bucks. Sit at the bar for an interactive experience with the staff or request a quiet table for a real date night. The Terrace offers great water views for a date night dinner without the kids. Photo courtesy of the restaurant. The Terrace, located in town and close to the action, this is a great spot to start a night out with oysters on the half shell and champagne at the bar. La Tapa, a steadfast and consistently reliable venue for quality food and atmosphere. The Tap Room, the only Craft Beer on island with a bar, this is a great spot to start or end a night at Mongoose. 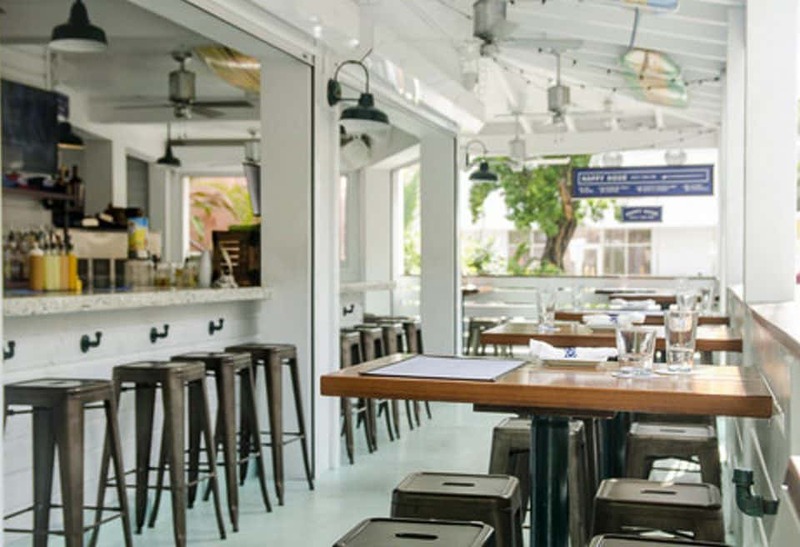 The Beach Bar represents the laid back watering hole people flock to the Caribbean to experience. The Beach Bar, is a popular place to enjoy live entertainment with your feet in the sand and surf in the background. Katie and family. Photo credit Savannah Loftus. As a 10-year resident of St. John, having raised a few youngsters from birth through elementary years, Katie & Bryan, still miss calling this rock home though they do get back a few months every year. 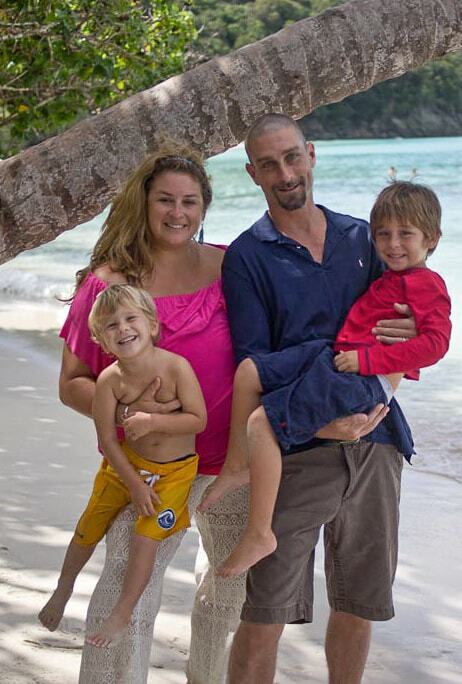 With two boys having grown up in the sun, surf and sand of St. John and now a new baby girl learning how to swing from the palms too, their family has a great grasp on what keeps kids entertained on a tiny piece of land in the middle of the ocean, and the great news is, it doesn’t take too much. So glad you liked it. If you ever need some St. John insight, I’m happy to help! Fantastic article. Full of detailed info coming from a former resident! Who else can you trust? I have had the pleasure of being a guest at Kamabesu Villa twice. To say it’s a gorgeous retreat is a MAJOR understatement. Highly recommend for big family vacations and for those of us single people who like to travel with big groups of friends. Oh my goodness, we need to go! Love all the info, so helpful!! Katie did a fabulous job describing the joys that await on St. John. We used to live there, too, and have been guests at her family’s villa (Kamabesu). I can attest to both the magic of the island and the exquisite tranquility of Kamabesu. Thank you to Katie for sharing! Her experience and hospitality cannot be rivaled. 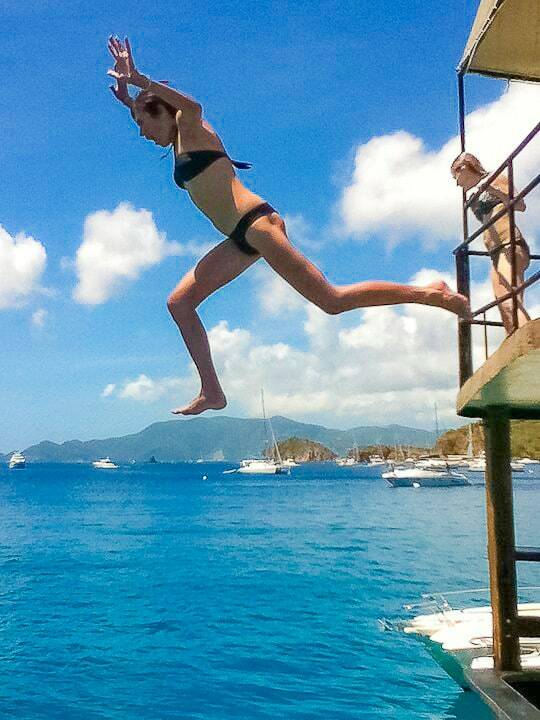 I love St. John and have been following Katie Tarta’s tips on where and when to go for several years. Her insight is spot on. St. John is truly a soulful and special place. Katie’s article reminds me of my favorite St John activities and introduces me to some new ones! I’m saving it for travel with grandkids, and forwarding it along to lots of friends. Hi, Katie. Thanks for the tips you mention in your article. We are coming early August with three kids, preteen and teenagers. We’re not sure what area of the island we should lodge given the rebuilding going on. Can you recommend an area? We will rent a villa but just not sure where. Love this article! We are looking at traveling May 2019 to the island with 5 families. Can you tell me what condo/villa rentals might be available for each family to have their own space but possibly in the same building? We had looked at Serendip but have now been told they may not reopen. Thank you!